The "Face" on Mars - evidence of alien intelligence? On July 25th, 1976, the NASA space probe Viking One, orbiting Mars, was photographing the planet's surface features in the Cydonia region. On one of the images, there was a huge rock formation, about one mile across, that seemed to have the appearance of a humanoid face. When it became public, the "face" on Mars phenomenon engendered frenzied public speculation of martian civilizations and the presence of alien intelligence. Yes, the conspiracy theorists were out in force, none more so than American author, Richard C. Hoagland. He was of the mind that NASA was deliberately withholding all sorts of evidence of extraterrestrials from the general public. The "face" on Mars was a godsend for him. 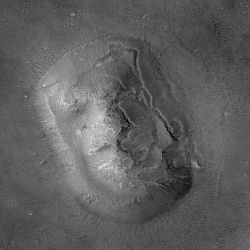 He maintained that the "face" was part of an ancient martian city and cited other surrounding rock formations as further evidence. These pyramidal structures, he argued, were all arranged in a precise geometric pattern, incorporating such mathematical constants as pi, the square roots of both two and three and the number three itself. His claims didn't end there! Hoagland also proposed that the larger of the two martian moons, Phobos, was artificial, built by the ancient inhabitants of the planet, that there had once been an ancient civilization on the Moon, that there was life on Jupiter's moon, Europa and that the moon of Saturn, Iapetus, was another one that was artificially created. Years later, new NASA probes were sent to the red planet, returning much clearer images of the surface than the original Viking One. During the years 1997-2006, the Mars Global Surveyor was able to send back high resolution images, far more detailed than the ones from 1976. The "face" on Mars was shown to be nothing more than a natural rock formation. 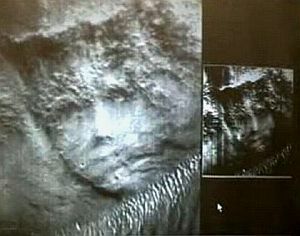 Even Hoagland, faced with such evidence, conceded that the feature didn't resemble a face, but still insisted that "nothing in this image is natural". 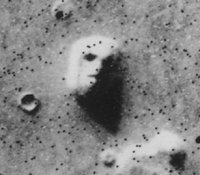 Respected astronomer, Carl Sagan, commented that there are other examples of "faces" on Mars, which, for some reason, haven't elicited the same publicity as the Cydonia one. Situated in a rocky area in the northern hemisphere of Mars called Libya Montes is this fine example of a human face. It's far superior to the famous one discussed above, as I think you'll agree. One thing that makes it slightly controversial is that it seems to be unaffected by different viewpoint angles, or different directions of any shadows cast by the Sun. It has been called the "crowned face". 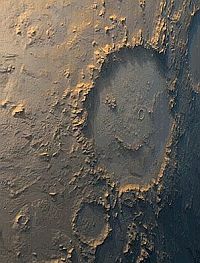 Mars has its own "smiley face"! 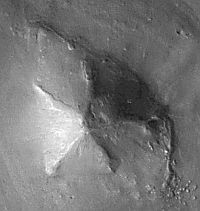 This crater is called Galle, found on the rim of the impact basin Argyre Planitia. The mouth is a curved mountain range and the eyes are clusters of mountains. Naturally, the various conspiracy theories put forward by such people as Richard C. Hoagland are generally dismissed by the mainstream scientific community, but Hoagland's assertions, that NASA is suppressing evidence of alien civilizations, can be neither proved nor disproved. For all we know, such evidence may have been discovered and any governments involved may have considered it in the best interests of the human race to keep such information to themselves. Who can say? In the interests of keeping this website a serious look at the Universe, I would have to assert that it is highly unlikely.